This is the first in a series of quick and simple posts focusing on genetic shifts across Eurasia since the Bronze Age. Any thoughts about what we're seeing in these Global25/nMonte models and Principal Component Analysis (PCA) below? Feel free to let me know in the comments. By the way, the Bronze Age Sicilian, from a "Beaker" burial site at Partanna, western Sicily, and dated to 2500–1900 BCE, is from the Olalde et al. 2018 dataset (see here). The relevant Global 25 coordinates are available at the usual place here. Update 26/02/208: Thanks for the comments. I've tweaked the models by adding plausibly more proximate ancient and modern-day reference populations, including Peloponnese Neolithic farmers (Peloponnese_N), Kura-Araxes (Armenia_EBA) and Moroccans. Interestingly, the proportion of Yamnaya-related ancestry in the modern-day Sicilians dropped significantly, while it disappeared altogether in the Beaker Sicily individual. Hmm. The Sicilian BB sample already has IranNeo influence prior to the Minoan/Mycenaean/Archaic Greek/Phoenician possible migrations. Clearly, with the arrival of IE languages there is an increase in Yamnaya admixture. My guess is that there was a metal-searching movement to Sicily and/or Sardinia in the 3rd millennium BCE. Clearly two directions of migrations, one from the North, Indo-European, Italic and Germanic primarily and one from the South and East, Greek and Near Eastern with a small amount of African slaves or Moorish invaders it seems. I'm pretty sure they were phenotypically more homogeneous then, like Sardinians today, while they are much more variable now, with phenotypes ranging from Northern European like to Near Eastern. I would like to know whether Sardinians themselves changed and how much. Because Sardinia had a lot of foreign settlements in prehistory and history, starting with BBC, after the initial Cardial Neolithic. From visual analysis, it looks like to get to Sicilians, the easiest ancient model is Mycenaean+Central_European (though this may or may not be most historically and linguistically sensible). For Balkans it's Mycenaean+Slavic. The Balkans BA populations don't seem quite right as ancestral without extensive Anatolia_BA like ancestry. To get to the Mycenaeans themselves, it seems like Tepecik_Ciftlik+Balkans_BA or Anatolia_BA+Balkans_BA either work, depending on whether we pick more or less Anatolian-like Balkans_BA. For the the Balkans again, one thing I find interesting it does seem like samples like Balkans_MP_N, Lepenski_Vir, Varna_Outlier, particularly HG rich samples from early SE Europe, these do actually seem to fall between Baltic_BA and Balkans_BA/Balkans_CA on dimensionality distinguishing Baltic BA and SE Europe Neolithic from Steppe and Iberia Neolithic. (This is also the case for Nordic_MN_B and Nordic_BA, which I find slightly harder to explain). The Yoruba is certainly from the Moors. NW African populations (who the Moors were named for) have at least some Sub-Saharan or close admixture that predates the slave trade. I don't suppose some knowledgeable person could remind me who "Iran Neolithic" are, and how they relate to "Iran Chalcolithic", could they? Which (or both?) has a lot of CHG? Does anybody understand what this might mean? Indeed interesting to see some Iran_N in the Sicilian Beaker, albeit at a somewhat lower share than in Minoan_Odigitria (where it was 13.7% according to Lazaridis et al.). This vindicates the theory suggested by Harrison and Heyd about a 3rd millennium expansion of a cultural network centered around the Mesopotamian early urban societies. This interaction sphere reached the central Mediterranean including Sicily between 2600 and 2200 BC. Yet it has to be noted that this Sicilian Beaker is still much more Barcin_N than any modern Sicilian, and accordingly, in the PCA of moderns falls into the no man's land between Sardinians and all other Europeans. And finally, as the Barcin_N got strongly reduced, the Iran_N got reduced by the same amount too. Which means a lot of additional Iran_N had to migrate to Sicily afterwards. The Iran_N that is already in the Beaker doesn't explain all of the Iran_N in modern Sicilians. Iran Neolithic based on about 8000 kya samples from Northern Iran. I would not say it have CHG, more like it is related to CHG by common ancestry, but have different admixtures. In a sense you could say that has a lot of CHG, since its main ancestry is apparently something CHG related. Iran Chalcolithic is the successor of Iran Neolithic and it is less CHG like, because it has additional (probably Levantine) admixture that dilutes the CHG related ancestry. Nevertheless, it still has a strong CHG relatedness from Iran Neolithic. Iran_N is a relative of CHG, not the same, but similar. It's more basal Eurasian than CHG. Iran_ChL is more mixed up, it has Levantine and Caucasus admixture. Ah crap, now Slumbery was quicker. :D But we're saying the same, more or less. Why is Yamnaya higher in modern Sicilians than ancient ones? I would have thought it would be the reverse due to migrations from North Africa. - Roman time migration from Italy. - Maybe Normans (I do not know how many of them went there though). - Something we do not know. Most of all there were two invasions from mainland Italy to Sicily in the LBA and in the Final BA. The first is called Ausonio I, and it brought Sub-Apenninic influence to Sicily. The second wave is called Ausonio II and it brought Protovillanovan influence. And according to practically all ancient historians the Sicels were originally at home in mainland Italy and got expelled from there a few centuries before the Greeks arrived. 25% Yamnaya in Sicilians? Are you sure about that? I have a feeling West Asian ancestry not quite captured by Barcin, Iran, or Levant is probably inflating that. Thinking the CHG present in CA/BA Anatolia/Armenia/Iran. 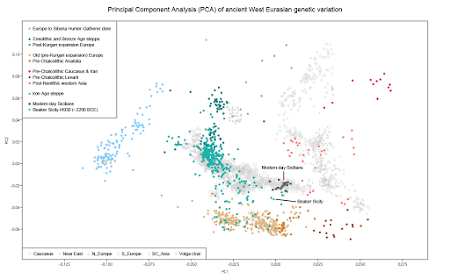 It looks like modern Sicilians on the PCA are just dragged a bit towards 'post neolithic West Asians', which I don't know if that is likely, but it sounds reasonable, can someone try modeling them as Beaker_Sicily plus various 'post neolithic West Asians'? I doubt that Sicilians have 25% of Yamnaya. Modelling Sicilians as 25% Yamnaya inflates the Levant. Definitely no steppe for Beaker Sicily - why would it - its part of the original, south proto-Beaker province. And obviously modern Sicilians have no steppe either; but have acquired perhaps 12% additional 'Levant' admixture. Looking at North Italian Beakers, the male R1b has the largest steppe component, not surprisingly. Overall, the situation appears that northern, Corded derived barbarians integrated themselves and ultimately took over the Bell Beaker culture, although the Beaker pot itself is probably Corded derived. Dave, does the Sion lady have enough markers for your dataset ? Come on, you're overfitting. You can do better than that. In this model Yamnaya_Samara simply represents various streams of ancestry related to Yamnaya. It might be possible to come up with better, more realistic models for Sicilians. Why don't you try? The data and software are freely available. And if you're not happy with this data and software, then show us models using other data and software. I don't know which sample is the Sion one. Look for the relevant ID in the datasheet. But if it's not there, then it probably doesn't have enough markers to be included. They look pretty good I think. Probably more realistic than my simple models. So, I don't think it gets better than this. The Beakers of Sicily got exterminated, by the way? When modeling it's best not to use too many closely related groups representing basically the same streams of ancestry, like Germany_MN and France_MLN. In other words, it's more useful to mostly use distantly related reference samples, and to work out the most likely sources of ancestry not by pitting closely related groups against each other, but to swap them and see how the models change in terms of the statistical fits, and whether they improve and become more realistic in terms of the ancestry proportions. You're referring to the Circum-Aegean phenomenon proposed in this excerpt (from a book) I routinely post here, right? Indeed, the midpoint of the Beaker's date range aligns quite well to the 2200BC mark. "And obviously modern Sicilians have no steppe either"
You mean that ironically or unironically? They must surely have a bit given the presence of downstream S116 there. Also--I remember you've proposed in the past that Beaker movements (till 2000BC) didn't contribute much to Padan plain's overall share of steppe ancestry compared to the Polada wave that came through shortly thereafter. Do you still stand by that? I gotta say, n=3, but results aren't inconsistent with your theory. I was expecting the other two to be just as steppic as the first guy. Of course Sicilians have steppe ancestry. All Europeans do, except maybe some Sardinians. For the first question - maybe west Sicilians. Its complex/ attenuated in East, because it's mostly BA Balkan type 'eastern' ancestry mediated via colonists. 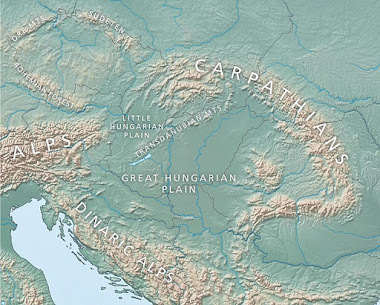 as for second - 'Also--I remember you've proposed in the past that Beaker movements (till 2000BC) didn't contribute much to Padan plain's overall share of steppe ancestry compared to the Polada wave that came through shortly thereafter. Do you still stand by that? I gotta say, n=3, but results aren't inconsistent with your theory. I was expecting the other two to be just as steppic as the first guy." Only 2 of 3 Italian Beakers have steppe ancestry, and both less than the male. I'd guess we'll have to evaluate Polada samples if and when they come, to see what continuity they have with north Italian BB. Yeah, exactly---the r1b guy has "decent" steppe ancestry and one female has some, but the other female lacks it, essentially. A few months back, if you recall, I surmised they'd all be like the R1b guy. So, yeah, perhaps Beakers were a flash in the pan there. It's one of the reasons I'm reluctant to use the R1b guy in modeling early Italic migrants down the peninsula. Im not sure to be honest. Perhaps it would need at least some additional northern arrivals after the BB period ? Unless it was all a massive founder effect from one episode. Two models for moderns, with and without Tunisian Jews (considering the possibility that Roman North Africans were just like them, and that most of Sicilians slaves were from there, also that the Islamic conscripts came from there. It just makes sense to add North Africans for Sicilians). For Beaker_Sicily... there's something really strange going on here, there's something severely lacking (I tried everything). "And obviously modern Sicilians have no steppe either; but have acquired perhaps 12% additional 'Levant' admixture." Of course, Sicilians have some Steppe admixture. I usually see estimates at 15%. Remeber, Sicilians have a tiny dose of Northwest African admixture I assume from the Moors. Without a Moroccan reference, Sicilian scores will be inaccurate. Sicilians do have Northwest African ancestry, ofc, but unfortunately there's no sure-fire proxies with which to model it. Tunisian Jews likely have complex ancestry. Mozabites likely have considerably more SSA than Roman-Age and Early Islamic NAs would have due to the trans-Saharan camel networks. We'll have to wait for KEB and Guanche genomes. Check out the new models. No more Yamnaya-related ancestry for Miss Beaker Sicily. Oops. Those new scores make sense. Does Peloponnese_N_outlier:I3920 have any CHG? For it looks like after 2000 BC or so, southern Italy received admixture from mainland Italy (before that north Europe), Levant area, North Africa, and possibly also Anatolia. It looks like most of southern Europe remained overwhelmingly EEF up until the Bronze age. Also, in Italy and the Balkans they didn't acquire much WHG admixture. Sardinians and Minoans are good representatives of where lots of Meditreaen people between 2000 BC and 1000 BC clustered. IMO, the Balkans clustered close to Italy before the Slavic expansion. Little WHG, not much Steppe, lots of EEF, and some CHG stuff. The question now is, how and when did people rich in CHG from Anatolia or somewhere nearby make a big impact on Italy & southeast Europe. Plus, we can see their influence in Spain and France. Those new scores make sense. Does Peloponnese_N_outlier:I3920 have any CHG? Yep, sure does. Clusters with Minoans. It may be the case that we have found an ancient and hidden Mediterranean network of peoples. Also, Beaker_Sicily might be so small in my runs for modern Sicilian because Mycenaeans are substituting them. You know, it's almost 5am here and I want to sleep. PS: Sicilian paper, isn't something here already about this? After I wake up I'll see it. Spanish and French signals might be from Roman times. Also, is there a geniality gene linked to the CHG? It seems that every people that got in contact with them flourished as civilizations, be them the Yamnaya, these Mediterraneans, Levantines, Mesopotamians and even Harappans. CHG seems to be a constant. Went reductionist and chose 3 top pops from my overfits. Didn't really change the euclidean distance appreciably, though. Iberia_Chl was included to account for the Sicilian WHG folks ANFs would have mixed with upon arrival. @Dave: Yeah, this one does look rather Minoan but with extra WHG. It would be interesting to see if the Italian Beakers prefer Remedello as a source of Neolithic ancestry over Barcin. Re: overfitting, yes, you're right. I was never using this approach with Global_10 or D-stats datasheets. But then some people prefer to give more options and let the algorithm choose. And besides, with Global 25 the models are more accurate with proximate sources. If you include more distant ones you get strange things, as it happened to your first model showing 8.8% Yamnaya. But of course I double check, and checked the paper too, where D-stats show that the Sicilian BB has no steppe ancestry. In the full output you can also see models using ancestorsMix which avoids overfitting (when overfeeding with sources). It's turning out to work quite better than expected. Especially as we get more and more samples, more admixed, and choices become more difficult (and subjective). Still testing it, but might be a good option for these times. What is Your theory about Etruscans, that Rob mentioned. I'd be a bit more careful with such macro attributions. I actually used to hold the same position, but was forced to revise it upon closer scrutiny. That "geniality" may, in fact, lie in some ANF-like population residing in Northern Mesopotamia/SE Anatolia. Or, perhaps in some early ANF-CHG type of a hybrid. -Recall the "Uruk" migrants in the Caucasus and the concomitant rise of proto-urban settlements there(Laylatepe, etc)? Maykop is linked to this, too. -Recall also the civilization associated with Catalhoyuk, Gobekli(~9,000BC), Trypilia, and Starcevo. The first two likely didn't pack much CHG, but were probably rather Barcin-like. Let me say a bit more about this: European EEFs show presence of Hg E. 6500BC Barcin is somewhat more "south-shifted" than earlier 8000BC Boncuklu ANFs. Later Neolithic Anatolia shows cultural similarities to Levantine PPNB. Together with one of Dave's qp runs from some time ago, this all seems to point to an influx into Western Anatolia by 7000BC from somewhere further to the East. Maybe around former Gobekli area. -"Grand civiliations" on the Iranian plateau and the Oxus/Mughrab basin(BMAC) arose soon after Iran_chl date range, not before. -As for Egypt, we shouldn't be too quick to attribute its civ to CHG because the influx of people by dynastic times was probably even heavier in ANF-PPNB type of ancestry(adding on to some native IAM or Natufian-like pop). Could be, ofc. Why not? Just not too far south. If Sicilian have 0.5/0.8 Yoruba then they should be around 3 % North African, you can't be 8.5% Moroccan and not have >2% Yoruba. One of the two is wrong. We have to find a better proxy for that type of admixture in Sicily, maybe when we will have samples from ancient North Africa/Egypt things will make more sense. We need modern-day Greek islanders samples. LOL. Even Davidski's biased amateur genetic "studies" can't make Sicilians into the recent MENAs he's claimed they are and wishes they could be. They're basically still the same as the Beaker on the PCA, just pulled a little more away from farmers and toward IE components (Yamnaya/CHG/Iran_N) and clustering even closer to Mycenaeans. You're living in a fantasy world if you think Sicilians don't have more recent MENA ancestry than most other Europeans. The objective now is to find out where it came from-- could it be post-Beaker but still prehistoric, Phoenician, Carthaginian, Roman era people coming from the Near East/North Africa, medieval Saracens or Moors, or some combination of any of these? Who knows, but these are all great peoples and any Sicilian should be proud to count them among his ancestors. Predictably, Dodecanese are the closest Aegeans to Cypriots. Seems to me like the Yamnaya ancestry in your run is a little bloated. 25%? is a figure I've seen given for Northern Italy. I thought modern Sicilians were more in the 10-15% range. Check out the update to his post. Using different references reduces Yamnaya to more realistic levels. Basically around 50% something ancient Southeastern European like, 30% Near Eastern on the Armenia-Levant cline (but towards the latter) and 20% northwestern sort of input. You can mix the refs up a bit and even get somewhat better fits with some combos but the general model seems to work well and accords with historical considerations too. Agrees with David's more basic modelling too - Eastern Sicilians are more Neolithic-like while Western ones are both more near eastern and northwestern-like. If Levant_BA is preferred to Outlier, you get worse fits but also a tiny bit of Tanzania (I'm just using ancient samples, don't like mixing it up). Did the Near Eastern gladiator have a little bit of SSA? And yeah, the paper seems to point towards extra Caucasus-Iran like in the Aegean, nothing steppe in the Beaker. Namedguest, in nMonte the correlation between Beaker and Mycenaeans is in the high .90s so yeah, probably shouldn't be used together. So could this CHG like ancestry in the Sicilian Beaker come from this other Non-steppe population (devoid of EHG) like found in the Minoan or is Steppe really the best fit? Of course I was joking, but if we're allowed to delve a little, I don't think the Anatolian Farmers were very meritorious. Actually, I firmly believe that Agriculture was discovered by mistake, with kids playing with seeds, burying them. Now, if we look at admixture plots of the CHG, as we remove their characteristic single color, it seems that they were made of ASI + Basal + European Hunter Gatherer, so they might as well (we can't affirm any of this) be a byproduct from a time where ASI-like people were more widespread out of India and European Hunter Gatherers were more into the Caucasus. Alright, enough talk about the CHG "smart" gene or whatever. This won't go anywhere productive. Have a look at the update to my blog post. Is the Vucedol sample contaminated? It looks like a modern. Random q: Are you Brazilian by chance? Haha, I know you were joking. Things aren't ever that simple and I wasn't thinking about your question solely in terms of innate inheritance, btw, but more so in terms of cultural transmission over the generations. Why do you say Anatolian Neolithic communities weren't very meritorious? Some of the earliest proto-urban sites are found all across the area. Moreover, I don't see Western Anatolia, per se, as a source for ANF admixture in the eastern Near East---be it in the Caucasus or Iran. Rather, it was more of a sink from some North Syrian/Mesopotamian/Eastern Anatolian source. It is from this common well-spring that post-Neolithic Caucasus and Iran_Chl obtained their ANF-like signal. Your ASI(Cryptic ENA) theory was discussed here at some point, but more so regarding Iran_N. "Does anybody understand what this might mean?" There is (or was) a lot of soft metals in Sardinia. Taking a look at that paper, it really looks like that shortly after the initial spread of EEF you then have a spread of CHG/Iran_N like people into Anatolia, across southern europe via the med and maybe as far as Iberia (qpAdm showng Iberia_MN with 26.6% WHG/26.7% CHG/50.3% Anatolia_N pvalue 0.809) Though this CHG background does not last long in Iberia and D stats does not support a CHG heritage in Iberia at the time. Makes me wonder if some of the Beaker heritage seen in Iberia could be modeled with CHG/Iran_N without the Steppe. If so would this heritage show more of a blend of Iberia_Beaker with Central Europe Beaker in the colonization of Britain. Maybe I will play with that over the weekend.